On Thursday dozens more OHS students got a taste of real job interviews as a variety of local businesspeople questioned the teens. 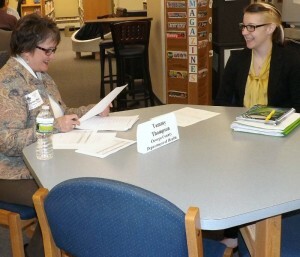 Julia Knight interviews with Tammy Thompson during Thursday’s mock job interview event at Oswego High School. Professionals from unions, Oswego Police Department, Novelis, SUNY Oswego, the food industry and other fields put the students through their paces in mock job interviews in Oswego High School’s Media Center. The professionals said they were impressed with the way the students handled the situation. The activity was designed to allow OHS seniors to get a real world work experience with interview techniques, according to Stephanie Steiger of the OHS Career Center. The program has been conducted for the past several years, said Ben Richardson, an OHS social studies/economics teacher. The students really get a lot out of this exercise, he added. Dozens of students milled around the room waiting for a chance to interview with Mary Plummer of Aunt Mary’s Catering, Charles Searor of the the city police department, Chena Tucker of the SUNY Oswego Business Office and Jake Mulcahey of construction among others. The event was designed to help the students hone their skills for the day they would be interviewing for a real job or a college interview, Richardson explained. Julia Knight interviewed with Tammy Thompson, representing Human Services. “I am interested in business, specifically cosmetology. I like working with people. That’s my ultimate goal,” the OHS senior said. She admitted she “felt very nervous” during her first interview. “I think I made a good impression. She told me just to remain calm and be myself, be honest,” she said. The majority of the teens did very well, according to Thompson. They were very well prepared and poised, she added. Aleksandra Rozycka said the people that interviewed her put her at ease. She did a couple interviews, but there was no one representing the career field she hopes to enter – fashion. In the next 10 years she said she’d like to be a fashion director, probably in some place like New York City. One of the girls that didn’t come over to interview with her was “phenomenal,” Plummer said. The greatest part of the program is so many people from around the community help out, Plummer noted. “This is a great cooperative effort and we thank the community for its support,” Steiger said. The program has been conducted for about 14 years and is designed to allow OHS seniors to get a real world work experience with interview techniques, according to Ed Stacy, another of the teachers involved in the program. The bottom line is the district wants the students to go out and be confident when they interview for real jobs, colleges and graduate schools, said Richardson. “I have had several kids send me an email or come back and tell me that they used what they learned here to get a job,” Richardson told Oswego County Today. The teachers said that they realize the importance of students interviewing well, not only for jobs but college as well. They developed the program to simulate real life job interviews. The students dressed appropriately and many brought resumes and portfolios. The teens received immediate feedback from the interviewers. “I am interested in business, specifically cosementology. I like working with people. That’s my ultimate goal,” the OHS senior said. How about teaching them how to spell first, starting with the word “cosmentology”. And are there any students in Oswego with higher aspirations than “hair dresser” or “cosmentology…’er, cosmetology”? This is what the school budget of $78 million buckeroos produces? umm, actually – that would would be MY spelling error. And, what’s wrong with wanting to do something you like for a living? Steve…I’ll accept the spelling error as yours and you’re right, there is nothing wrong with doing something you like for a living. But I’d like to think that spending $77+ million, now $78+ million, on a school budget in dismal Oswego (where the majority of businesses consist of bars/tattoo parlors and the vast majority of teachers/administrators are born and educated in Oswego, thus perpetuating the problems) would be more fruitful and produce students with higher aspirations than “hair dresser”. If I’m not mistaken, our student population is declining, the graduation rate is below state average (which is pitifully low), the drop out rate is high, and only a small percentage of Oswego graduates go on to college. Remember, we’re talking about spending $78+ million per year in a small economically depressed town and asking taxpayers to foot the bill. We’re talking about a lot of money and I’d like to see a better return on that investment. Well done to take accountability for a slight faux pas that we are all guilty of doing sometimes :) I was so impressed with the students at the interviewing sessions and I cannot wait to be apart of it again next year!!! Thanks Chena. Sorry I didn’t make it to your corner of the room but I was a little pressed for time. Maybe next year (or sooner) Keep up the good work!